For other uses, see Heliosphere (disambiguation). This article is about the Sun's astrosphere. For astrospheres of other stars, see Stellar-wind bubble. Heliopause: the boundary between solar wind and interstellar wind where they are in equilibrium. Bottom: Logarithmic scale of the Solar System and Voyager 1's position. Gliese 445 on the far right, by way of contrast, is approximately 10,000 times further from the Sun than Voyager. Graphs of heliosheath detections by Voyager 1 and Voyager 2. Voyager 2 has since crossed the heliopause into interstellar space. The Heliosphere is the area under the influence of the Sun; the two major components to determining its edge are the magnetic field lines and the solar wind from the Sun. Three major sections from the beginning of the Heliosphere to its edge are the termination shock, the heliosheath, and the heliopause. Five spacecraft have returned much of the data about its furthest reaches, including Pioneer 10 (1972–1997; data to 67 AU), Pioneer 11 (1973–1995;44 AU), Voyager 1 and Voyager 2' (launched 1977, ongoing), and New Horizons (Launched 2006). A type of particle called an energetic neutral atom (ENA) has also been observed to have been produced from its edges. There are a host of spacecraft that observe the Sun and interplanetary space. One of the latest to explore the Sun, from nearer than ever before, is the Parker Solar Probe launched in 2018. Solar observations, such as during a Solar eclipse, allow observation of the Sun's Corona. While various types of space observatories also provide data on the Sun and its influences. The study of other Stars can also allow insights indirectly. Except for regions near obstacles such as planets or comets, the heliosphere is dominated by material emanating from the Sun, although cosmic rays, fast-moving neutral atoms, and cosmic dust can penetrate the heliosphere from the outside. Originating at the extremely hot surface of the corona, solar wind particles reach escape velocity, streaming outwards at 300 to 800 km/s (671 thousand to 1.79 million mph or 1 to 2.9 million km/h). As it begins to interact with the interstellar medium, its velocity slows to a stop. The point where the solar wind becomes slower than the speed of sound is called the termination shock; the solar wind continues to slow as it passes through the heliosheath leading to a boundary called the heliopause, where the interstellar medium and solar wind pressures balance. The termination shock was traversed by Voyager 1 in 2004, and Voyager 2 in 2007. It was thought that beyond the heliopause there was a bow shock, but data from Interstellar Boundary Explorer suggested the velocity of the Sun through the interstellar medium is too low for it to form. It may be a more gentle "bow wave". Starting in May 2012 at 120 au (1.8×1010 km; 1.1×1010 mi), Voyager 1 detected a sudden increase in cosmic rays, an apparent signature of approach to the heliopause. In the summer of 2013, NASA announced that Voyager 1 had reached interstellar space as of 25 August 2012. Pioneer 10 was launched in March 1972, and within 10 hours passed by the Moon; over the next 35 years or so the mission would be the first out laying out many firsts of discoveries about the nature of heliosphere as well as Jupiter's impact on it. Pioneer 10 was the first spacecraft to detect sodium and aluminum ions in the Solar Wind, as well as helium in the inner Solar System. In November 1972, Pioneer 10 encountered Jupiter's enormous (compared to Earth) magnetosphere, and would pass in and out of it and heliosphere 17 times charting its interaction with the Solar Wind. Pioneer 10 returned scientific data until March 1997, including data on the Solar wind out to about 67 AU at that time. It was also contacted in 2003, when it was a distance of 7.6 billion miles from Earth (82 AU), but no instrument data about the Solar Wind was returned then. Voyager 1 surpassed the radial distance from Sun of Pioneer 10 at 69.4 AU on 17 February 1998, because it was traveling faster gaining about 1.02 AU per year. Pioneer 11, launched a year after Pioneer 10, took similar data as Pioneer out to 44.7 AU in 1995 when that mission was concluded. Pioneer 11 had a similar instrument suite as 10, but also had a Flux-Gate Magnetometer. Pioneer and Voyager spacecraft were on different trajectories, and thus recorded data on the heliosphere in different overall directions away from the Sun. Data obtained from Pioneer and Voyager spacecraft helped corroborate the detection of a hydrogen wall. Voyager 1 and 2 were launched in 1977 and operated continuously to at least the late 2010s, and encountered various aspects of the heliosphere past Pluto. 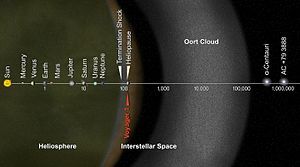 In 2012 Voyager 1 is thought to have passed through the Heliopause, and in 2018 there is some indications Voyager 2 may be experiencing the same threshold. While its twin spacecraft, Voyager 1, crossed the boundary known as the Heliopause in 2012, Voyager 2 carries instruments that will provide new observations into the gateway of interstellar space. The twin Voyagers are the only man-made objects to have entered interstellar space. However, while they have left the Heliosphere, they have not yet left the boundary of the Solar System which is considered to be the outer edge of the Oort Cloud. Upon passing the Heliopause, Voyager 2's Plasma Science Experiment (PLS) observed a sharp decline in the speed of solar wind particles on 5 November and there has been no sign of it since. The three other instruments on board measuring cosmic rays, low-energy charged particles and magnetic fields also recorded the transition. The observations complement data from NASA's IBEX mission. NASA is also preparing an additional mission, Interstellar Mapping and Acceleration Probe (IMAP) which is due to launch in 2024 to capitalise on Voyager's observations. Despite its name, the heliosphere's shape is not a perfect sphere. Its shape is determined by three factors: the interstellar medium (ISM), the solar wind, and the overall motion of the Sun and heliosphere as it passes through the ISM. Because the solar wind and the ISM are both fluids, the heliosphere's shape and size are also fluid. Changes in the solar wind, however, more strongly alter the fluctuating position of the boundaries on short timescales (hours to a few years). The solar wind's pressure varies far more rapidly than the outside pressure of the ISM at any given location. In particular, the effect of the 11-year solar cycle, which sees a distinct maximum and minimum of solar wind activity, is thought to be significant. On a broader scale, the motion of the heliosphere through the fluid medium of the ISM results in an overall comet-like shape. The solar wind plasma which is moving roughly "upstream" (in the same direction as the Sun's motion through the galaxy) is compressed into a nearly-spherical form, whereas the plasma moving "downstream" (opposite the Sun's motion) flows out for a much greater distance before giving way to the ISM, defining the long, trailing shape of the heliotail. The limited data available and unexplored nature of these structures have resulted in many theories as to their form. The solar wind consists of particles (ionized atoms from the solar corona) and fields like the magnetic field that are produced from the Sun and stream out into space. Because the Sun rotates once approximately every 25 days, the magnetic field transported by the solar wind gets wrapped into a spiral. The Solar wind affects many other systems in the Solar System; for example, variations in the Sun's own magnetic field are carried outward by the solar wind, producing geomagnetic storms in the Earth's magnetosphere. The heliospheric current sheet is a ripple in the heliosphere created by the rotating magnetic field of the Sun. Extending throughout the heliosphere, it is considered the largest structure in the Solar System and is said to resemble a "ballerina's skirt". The solar wind is traveling at supersonic speeds within the Solar System. 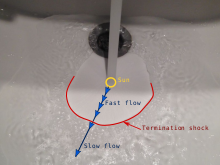 At the termination shock, a standing shock wave, the solar wind falls below the speed of sound and becomes subsonic. It was previously thought that, once subsonic, the solar wind would be shaped by the ambient flow of the interstellar medium, forming blunt nose on one side and comet-like heliotail behind, a region called the heliosheath. However, observations in 2009 showed that this model is incorrect. As of 2011, it is thought to be filled with a magnetic bubble "foam". The outer surface of the heliosheath, where the heliosphere meets the interstellar medium, is called the heliopause. This is the edge of the entire heliosphere. Observations in 2009 led to changes to this model. In theory, the heliopause causes turbulence in the interstellar medium as the Sun orbits the Galactic Center. Outside the heliopause, would be a turbulent region caused by the pressure of the advancing heliopause against the interstellar medium. However, the velocity of Solar wind relative to the interstellar medium is probably too low for a bow shock. The termination shock is the point in the heliosphere where the solar wind slows down to subsonic speed (relative to the Sun) because of interactions with the local interstellar medium. This causes compression, heating, and a change in the magnetic field. In the Solar System, the termination shock is believed to be 75 to 90 astronomical units from the Sun. In 2004, Voyager 1 crossed the Sun's termination shock, followed by Voyager 2 in 2007. The shock arises because solar wind particles are emitted from the Sun at about 400 km/s, while the speed of sound (in the interstellar medium) is about 100 km/s. (The exact speed depends on the density, which fluctuates considerably.) The interstellar medium, although very low in density, nonetheless has a constant pressure associated with it; the pressure from the solar wind decreases with the square of the distance from the Sun. As one moves far enough away from the Sun, the pressure of the solar wind drops to where it can no longer maintain supersonic flow against the pressure of the interstellar medium, at which point the solar wind slows to below its speed of sound, causing a shock wave. Further from the Sun, the termination shock is followed by the heliopause, where the two pressures become equal and solar wind particles are stopped by the interstellar medium. Evidence presented at a meeting of the American Geophysical Union in May 2005 by Ed Stone suggests that the Voyager 1 spacecraft passed the termination shock in December 2004, when it was about 94 AU from the Sun, by virtue of the change in magnetic readings taken from the craft. In contrast, Voyager 2 began detecting returning particles when it was only 76 AU from the Sun, in May 2006. This implies that the heliosphere may be irregularly shaped, bulging outwards in the Sun's northern hemisphere and pushed inward in the south. The heliosheath is the region of the heliosphere beyond the termination shock. Here the wind is slowed, compressed and made turbulent by its interaction with the interstellar medium. At its closest point, the inner edge of the heliosheath lies approximately 80 to 100 AU from the Sun. A proposed model hypothesizes that the heliosheath is shaped like the coma of a comet, and trails several times that distance in the direction opposite to the Sun's path through space. At its windward side, its thickness is estimated to be between 10 and 100 AU. 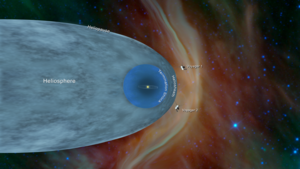 Voyager project scientists have determined that the heliosheath is not "smooth" – it is rather a "foamy zone" filled with magnetic bubbles, each about 1 AU wide. These magnetic bubbles are created by the impact of the solar wind and the interstellar medium. Voyager 1 and Voyager 2 began detecting evidence for the bubbles in 2007 and 2008, respectively. The probably sausage-shaped bubbles are formed by magnetic reconnection between oppositely oriented sectors of the solar magnetic field as the solar wind slows down. They probably represent self-contained structures that have detached from the interplanetary magnetic field. At a distance of about 113 AU, Voyager 1 detected a 'stagnation region' within the heliosheath. In this region, the solar wind slowed to zero, the magnetic field intensity doubled and high-energy electrons from the galaxy increased 100-fold. At about 122 AU, the spacecraft entered a new region that Voyager project scientists called the "magnetic highway", an area still under the influence of the Sun but with some dramatic differences. This picture about the heliosphere was released on 28 June 2013 and incorporates results from the Voyager spacecraft. The heliopause is the theoretical boundary where the Sun's solar wind is stopped by the interstellar medium; where the solar wind's strength is no longer great enough to push back the stellar winds of the surrounding stars. This is the boundary where the interstellar medium and solar wind pressures balance. The crossing of the heliopause should be signaled by a sharp drop in the temperature of charged particles, a change in the direction of the magnetic field, and an increase in the number of galactic cosmic rays. In May 2012, Voyager 1 detected a rapid increase in such cosmic rays (a 9% increase in a month, following a more gradual increase of 25% from Jan. 2009 to Jan. 2012), suggesting it was approaching the heliopause. Between late August and early September 2012, Voyager 1 witnessed a sharp drop in protons from the sun, from 25 particles per sec in late August, to about 2 particles per second by early October. In September 2013, NASA announced that Voyager 1 had crossed the heliopause as of 25 August 2012. This was at a distance of 121 AU (18 billion km) from the Sun. Contrary to predictions, data from Voyager 1 indicates the magnetic field of the galaxy is aligned with the solar magnetic field. The heliotail is the tail of the heliosphere, and thus the Solar System's tail. It can be compared to the tail of a comet (however, a comet's tail does not stretch behind it as it moves; it is always pointing away from the Sun). The tail is a region where the Sun's solar wind slows down and ultimately escapes the heliosphere, slowly evaporating because of charge exchange. The shape of the heliotail (newly found by NASA's Interstellar Boundary Explorer – IBEX), is that of a four-leaf clover. The particles in the tail do not shine, therefore it cannot be seen with conventional optical instruments. IBEX made the first observations of the heliotail by measuring the energy of "energetic neutral atoms", neutral particles created by collisions in the Solar System's boundary zone. The tail has been shown to contain fast and slow particles; the slow particles are on the side and the fast particles are encompassed in the center. The shape of the tail can be linked to the sun sending out fast solar winds near its poles and slow solar wind near its equator more recently. The clover-shaped tail moves further away from the sun, which makes the charged particles begin to morph into a new orientation. Cassini and IBEX data challenged the "heliotail" theory in 2009. In July 2013, IBEX results revealed a 4-lobed tail on the Solar System's heliosphere. ENA detection is more concentrated one direction. The heliopause is the final known boundary between the heliosphere and the interstellar space that is filled with material, especially plasma, not from the Earth's own star, the Sun, but from other stars. Even so, just outside the heliosphere (i.e. the "solar bubble") there is a transitional region, as detected by Voyager 1. Just as some interstellar pressure was detected as early as 2004, some of the Sun's material seeps into the interstellar medium. The heliosphere is thought to reside in the Local Interstellar Cloud inside the Local Bubble, which is a region in the Orion Arm of the Milky Way Galaxy. The flow of the interstellar medium (ISM) into the heliosphere has been measured by at least 11 different spacecraft as of 2013. By 2013, it was suspected that the direction of the flow had changed over time. The flow, coming from Earth's perspective from the constellation Scorpius, has probably changed direction by several degrees since the 1970s. "Hydrogen wall" redirects here. For other topics, see Hydrogen (disambiguation). Predicted to be a region of hot hydrogen, a structure called the hydrogen wall may be between the bow shock and the heliopause. The wall is composed of interstellar material interacting with the edge of the heliosphere. One paper released in 2013 studied the concept of a bow wave and hydrogen wall. Another hypothesis suggests that the heliopause could be smaller on the side of the Solar System facing the Sun's orbital motion through the galaxy. It may also vary depending on the current velocity of the solar wind and the local density of the interstellar medium. It is known to lie far outside the orbit of Neptune. The current mission of the Voyager 1 and 2 spacecraft is to find and study the termination shock, heliosheath, and heliopause. Meanwhile, the Interstellar Boundary Explorer (IBEX) mission is attempting to image the heliopause from Earth orbit within two years of its 2008 launch. Initial results (October 2009) from IBEX suggest that previous assumptions are insufficiently cognisant of the true complexities of the heliopause. In August 2018, long-term studies about the hydrogen wall by the New Horizons spacecraft confirmed results first detected in 1992 by the two Voyager spacecraft. Although the hydrogen is detected by extra ultraviolet light (which may come from another source), the detection by New Horizons corroborates the earlier detections by Voyager at a much higher level of sensitivity. It was long hypothesized that the Sun produces a "shock wave" in its travels within the interstellar medium. It would occur if the interstellar medium is moving supersonically "toward" the Sun, since its solar wind moves "away" from the Sun supersonically. When the interstellar wind hits the heliosphere it slows and creates a region of turbulence. A bow shock was thought to possibly occur at about 230 AU, but in 2012 it was determined it probably does not exist. This conclusion resulted from new measurements: The velocity of the LISM (Local Interstellar Medium) relative to the Sun's was previously measured to be 26.3 km/s by Ulysses, whereas IBEX measured it at 23.2 km/s. This phenomenon has been observed outside the Solar System, around stars other than the Sun, by NASA's now retired orbital GALEX telescope. The red giant star Mira in the constellation Cetus has been shown to have both a debris tail of ejecta from the star and a distinct shock in the direction of its movement through space (at over 130 kilometers per second). Pioneer H, on display at the National Air and Space Museum, was a canceled probe to study the Sun. The precise distance to, and shape of the heliopause is still uncertain. Interplanetary/interstellar spacecraft such as Pioneer 10, Pioneer 11 and New Horizons are traveling outward through the Solar System and will eventually pass through the heliopause. Contact to Pioneer 10 and 11 has been lost. Initial data from Interstellar Boundary Explorer (IBEX), launched in October 2008, revealed a previously unpredicted "very narrow ribbon that is two to three times brighter than anything else in the sky." Initial interpretations suggest that "the interstellar environment has far more influence on structuring the heliosphere than anyone previously believed" "No one knows what is creating the ENA (energetic neutral atoms) ribbon, ..."
"The IBEX results are truly remarkable! What we are seeing in these maps does not match with any of the previous theoretical models of this region. It will be exciting for scientists to review these (ENA) maps and revise the way we understand our heliosphere and how it interacts with the galaxy." In October 2010, significant changes were detected in the ribbon after 6 months, based on the second set of IBEX observations. IBEX data did not support the existence of a bow shock, but there might be a 'bow wave' according to one study. January 1959: Luna 1 becomes the first spacecraft to observe the solar wind. 1972–1973: Pioneer 10 becomes the first spacecraft to explore the heliosphere past Mars, flying by Jupiter on 4 December 1973 and continuing to return solar wind data out to a distance of 67 AU. February 1992: After flying by Jupiter, the Ulysses spacecraft becomes the first to explore the mid and high latitudes of the heliosphere. 1992: Pioneer and Voyager probes detected Ly-α radiation resonantly scattered by heliospheric hydrogen. 2004: Voyager 1 becomes the first spacecraft to reach the termination shock. 2005: SOHO observations of the solar wind show that the shape of the heliosphere is not axisymmetrical, but distorted, very likely under the effect of the local galactic magnetic field. 2009: IBEX project scientists discover and map a ribbon-shaped region of intense energetic neutral atom emission. These neutral atoms are thought to be originating from the heliopause. October 2009: the heliosphere may be bubble, not comet shaped. October 2010: significant changes were detected in the ribbon after 6 months, based on the second set of IBEX observations. May 2012: IBEX data implies there is probably not a bow "shock". June 2012: At 119 AU, Voyager 1 detected an increase in cosmic rays. 25 August 2012: Voyager 1 crosses the heliopause, becoming the first human-made object to depart the heliosphere. August 2018: long-term studies about the hydrogen wall by the New Horizons spacecraft confirmed results first detected in 1992 by the two Voyager spacecraft. 5 November 2018: Voyager 2 crosses the heliopause, departing the heliosphere. These depictions include features that may not reflect most recent models. ^ Alexander J. Dessler (February 1967). "Solar wind and interplanetary magnetic field". Reviews of Geophysics and Space Physics. 5 (1): 1–41. Bibcode:1967RvGSP...5....1D. doi:10.1029/RG005i001p00001. ^ a b c "NASA Spacecraft Embarks on Historic Journey Into Interstellar Space". NASA. 12 September 2013. Retrieved 8 March 2016. ^ a b "NASA's Voyager 2 Probe Enters Interstellar Space". NASA Jet Propulsion Laboratory. 10 December 2018. Retrieved 14 December 2018. ^ a b c "NASA Voyager 1 Encounters New Region in Deep Space". ^ a b c "Voyager 2 Proves Solar System Is Squashed". NASA. 10 December 2007. Retrieved 8 March 2016. ^ a b c d e f "New Interstellar Boundary Explorer data show heliosphere's long-theorized bow shock does not exist". Phys.org. 10 May 2012. Retrieved 8 March 2016. ^ a b c Zank, G. P.; Heerikhuisen, J.; Wood, B. E.; Pogorelov, N. V.; Zirnstein, E.; McComas, D. J. (1 January 2013). "Heliospheric Structure: The Bow Wave and the Hydrogen Wall". Astrophysical Journal. 763 (1): 20. Bibcode:2013ApJ...763...20Z. doi:10.1088/0004-637X/763/1/20. ^ a b c d "NASA - Data From NASA's Voyager 1 Point to Interstellar Future". NASA. 14 June 2012. Retrieved 5 September 2018. ^ a b Greicius, Tony (5 May 2015). "NASA Spacecraft Embarks on Historic Journey Into Interstellar Space". ^ a b c "Pioneer 10: first probe to leave the inner solar system & precursor to Juno – NASASpaceFlight.com". www.nasaspaceflight.com. Retrieved 12 October 2018. ^ "NASA – Pioneer-10 and Pioneer-11". www.nasa.gov. Retrieved 12 October 2018. ^ "NASA – PIONEER 10 SPACECRAFT SENDS LAST SIGNAL". www.nasa.gov. Retrieved 12 October 2018. ^ a b c d "Pioneer 10–11". www.astronautix.com. Retrieved 12 October 2018. ^ a b Administrator, NASA Content (3 March 2015). "The Pioneer Missions". NASA. Retrieved 12 October 2018. ^ a b Thomas., Hall, Doyle (1992). "Ultraviolet resonance radiation and the structure of the heliosphere". ^ a b "Voyager 2 Approaches Interstellar Space - Sky & Telescope". Sky & Telescope. 10 October 2018. Retrieved 12 October 2018. ^ J. Matson (27 June 2013). "Voyager 1 Returns Surprising Data about an Unexplored Region of Deep Space". Scientific American. Retrieved 8 March 2016. ^ Mursula, K.; Hiltula, T. (2003). "Bashful ballerina: Southward shifted heliospheric current sheet". Geophysical Research Letters. 30 (22): 2135. Bibcode:2003GeoRL..30.2135M. doi:10.1029/2003GL018201. ^ a b c d e f Johns Hopkins University (18 October 2009). "New View Of The Heliosphere: Cassini Helps Redraw Shape Of Solar System". ScienceDaily. Retrieved 8 March 2016. ^ a b c d e f "First IBEX Maps Reveal Fascinating Interactions Occurring At The Edge Of The Solar System". 16 October 2009. Retrieved 8 March 2016. ^ a b c d Zell, Holly (7 June 2013). "A Big Surprise from the Edge of the Solar System". ^ a b Nemiroff, R.; Bonnell, J., eds. (24 June 2002). "The Sun's Heliosphere & Heliopause". Astronomy Picture of the Day. NASA. Retrieved 8 March 2016. ^ "MIT instrument finds surprises at solar system's edge". Massachusetts Institute of Technology. 10 December 2007. Retrieved 20 August 2010. ^ Steigerwald, Bill (24 May 2005). "Voyager Enters Solar System's Final Frontier". American Astronomical Society. Retrieved 25 May 2007. ^ "Voyager 2 Proves Solar System Is Squashed". Jet Propulsion Laboratory. 10 December 2007. Archived from the original on 13 December 2007. Retrieved 25 May 2007. ^ Donald A. Gurnett (1 June 2005). "Voyager Termination Shock". Department of Physics and Astronomy (University of Iowa). Retrieved 6 February 2008. ^ Celeste Biever (25 May 2005). "Voyager 1 reaches the edge of the solar system". New Scientist. Retrieved 6 February 2008. ^ David Shiga (10 December 2007). "Voyager 2 probe reaches solar system boundary". New Scientist. Retrieved 6 February 2008. ^ Than, Ker (24 May 2006). "Voyager II detects solar system's edge". CNN. Retrieved 25 May 2007. ^ Brandt, Pontus (27 February – 2 March 2007). "Imaging of the Heliospheric Boundary" (PDF). NASA Advisory Council Workshop on Science Associated with the Lunar Exploration Architecture: White Papers. Tempe, Arizona: Lunar and Planetary Institute. Retrieved 25 May 2007. ^ Cook, J.-R. (9 June 2011). "NASA Probes Suggest Magnetic Bubbles Reside At Solar System Edge". NASA/JPL. Retrieved 10 June 2011. ^ Rayl, A. j. s. (12 June 2011). "Voyager Discovers Possible Sea of Huge, Turbulent, Magnetic Bubbles at Solar System Edge". The Planetary Society. Archived from the original on 16 June 2011. Retrieved 13 June 2011. ^ Zell, Holly (5 December 2011). "NASA's Voyager Hits New Region at Solar System Edge". NASA. Retrieved 5 September 2018. ^ Amos, Jonathan (14 December 2010). "Voyager near Solar Systems edge". BBC News. Retrieved 10 December 2010. ^ a b "NASA's Voyager 1 Spacecraft Nearing Edge of the Solar System". Space.Com. 13 December 2010. Retrieved 15 December 2010. ^ Brumfiel, G. (15 June 2011). "Voyager at the edge: spacecraft finds unexpected calm at the boundary of Sun's bubble". Nature. doi:10.1038/news.2011.370. ^ Krimigis, S. M.; Roelof, E. C.; Decker, R. B.; Hill, M. E. (16 June 2011). "Zero outward flow velocity for plasma in a heliosheath transition layer". Nature. 474 (7351): 359–361. Bibcode:2011Natur.474..359K. doi:10.1038/nature10115. PMID 21677754. Retrieved 20 June 2011. ^ JPL.NASA.GOV. "Voyager – The Interstellar Mission". Archived from the original on 8 July 2013. ^ "Voyager probes to leave solar system by 2016". NBCnews. 30 April 2011. Retrieved 8 March 2016. ^ Cowen, R. (2013). "Voyager 1 has reached interstellar space". Nature. doi:10.1038/nature.2013.13735. ^ Vergano, Dan (14 September 2013). "Voyager 1 Leaves Solar System, NASA Confirms". National Geographic. Retrieved 9 February 2015. ^ Garner, Rob (26 February 2016). "NASA's IBEX Observations Pin Down Interstellar Magnetic Field". ^ Zell, Holly (6 March 2015). "IBEX Provides First View Of the Solar System's Tail". ^ Greicius, Tony (11 September 2013). "Voyager Glossary". ^ a b c Greicius, Tony (5 May 2015). "NASA Spacecraft Embarks on Historic Journey Into Interstellar Space". ^ "How Do We Know When Voyager Reaches Interstellar Space?". ^ a b c Zell, Holly (6 March 2015). "Interstellar Wind Changed Direction Over 40 Years". ^ Wood, B. E.; Alexander, W. R.; Linsky, J. L. (13 July 2006). "The Properties of the Local Interstellar Medium and the Interaction of the Stellar Winds of \epsilon Indi and \lambda Andromedae with the Interstellar Environment". American Astronomical Society. Archived from the original on 14 June 2000. Retrieved 25 May 2007. ^ Palmer, Jason (15 October 2009). "BBC News article". Retrieved 4 May 2010. ^ a b Gladstone, G. Randall; Pryor, W. R.; Stern, S. Alan; Ennico, Kimberly; et al. (7 August 2018). "The Lyman‐α Sky Background as Observed by New Horizons". Geophysical Research Letters. arXiv:1808.00400. doi:10.1029/2018GL078808. ^ a b Letzter, Rafi (9 August 2018). "NASA Spotted a Vast, Glowing 'Hydrogen Wall' at the Edge of Our Solar System". Live Science. Retrieved 10 August 2018. ^ "NASA Spotted a Vast, Glowing 'Hydrogen Wall' at the Edge of Our Solar System". Live Science. Retrieved 12 October 2018. ^ "No Shocks for This Bow: IBEX Says We're Wrong". 14 May 2012. ^ NASA – photojournal (15 October 2009). "The Bubble of Our Solar System". Retrieved 8 March 2016. ^ Kerr, Richard A. (2009). "Tying Up the Solar System With a Ribbon of Charged Particles". Science. 326 (5951): 350–351. doi:10.1126/science.326_350a. PMID 19833930. ^ a b "Complete Archive for Astrobiology Press Release, News Exclusive, News Briefs". 2 October 2010. ^ "Luna 1". nssdc.gsfc.nasa.gov. Retrieved 15 December 2018. ^ "Fact Sheet". European Space Agency. 15 March 2013. Retrieved 15 December 2018. ^ Lallement, R.; Quémerais, E.; Bertaux, J. L.; Ferron, S.; Koutroumpa, D.; Pellinen, R. (March 2005). "Deflection of the Interstellar Neutral Hydrogen Flow Across the Heliospheric Interface". Science. 307 (5714): 1447–1449.(SciHomepage). Bibcode:2005Sci...307.1447L. doi:10.1126/science.1107953. PMID 15746421. "Heliopause Seems to Be 23 Billion Kilometres". Universe Today. 9 December 2003. Retrieved 8 August 2007. "Space probes reveal Solar System's bullet shape". COSMOS magazine. 11 May 2007. Archived from the original on 13 May 2007. Retrieved 12 May 2007. Schwadron, N. A.; et al. (6 September 2011). "Does the Space Environment Affect the Ecosphere?". Eos. 92 (36): 297–301. Bibcode:2011EOSTr..92..297S. doi:10.1029/2011eo360001. Wikimedia Commons has media related to Heliosphere.